The Muteppō (無鉄砲) honten is way out in the hinterland of Kyoto Prefecture. 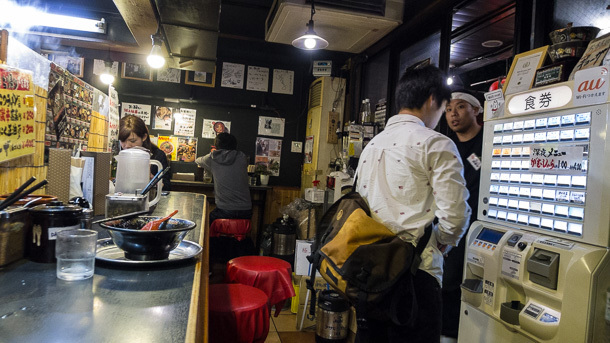 Fortunately for Tokyo tonkotsu fiends in search of their next hit of thick pork soup and noodles, in 2010 August they opened a satellite in Egota, Nakano Ward (無鉄砲東京中野店), about a ten minute walk north from Numabukuro Station. 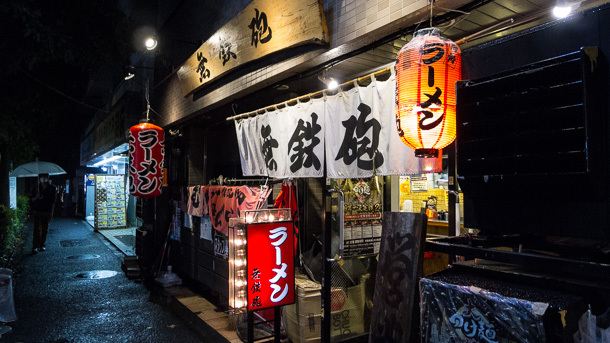 Though there isn’t much action in this mostly residential area, the Seibu Shinjuku Line makes it an easy trip from central Tokyo, or perhaps a dinner stop for commuters on the way out to Saitama Prefecture. I’m always amazed by these shops that draw customers from far beyond their local neighborhoods, despite a somewhat out-of-the-way location. 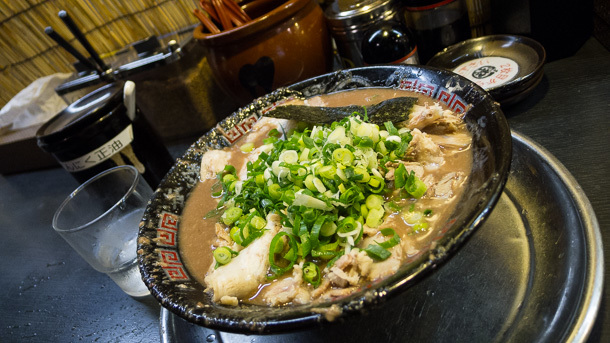 Muteppō quickly shot to the upper tier of Tokyo ramen rankings shortly after opening, and has remained there since. By the time I arrived about 7:00 on a Friday night, it was about the only thing open on its sleepy, suburban road. There was no queue, but most of the seats inside were occupied. Though technically a tonkotsu, the soup is infused with so much suspended fat and solids from roasted pork bones that it’s almost like a gravy when it first comes out. At Muteppō they have a great feature where, for free of charge, you can thin your soup with a fish or tonkotsu stock as you work down through the bowl. The chashu heaped on top is very thinly sliced but still quite moist, and falls apart into strips as you eat. It’s like pork noodles on top of your pork gravy. Muteppō also makes a tsukemen version, served at a separate shop one stop further out on the same train line. As thick as this soup was, I can’t imagine how a tsukemen could get much more viscous. Seems like a trip is in order. I was thankful for the walk back to the station afterward, needed locomotion while attempting to digest a hearty meal like that. 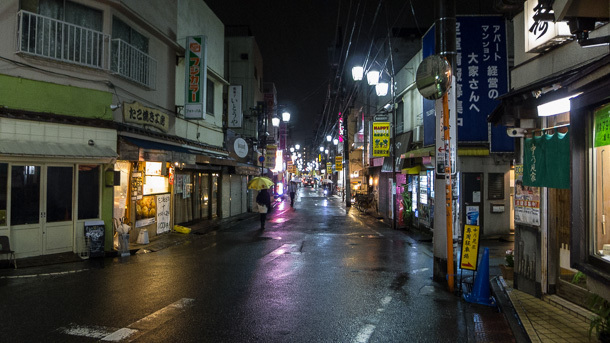 The shōtengai through which you walk on the way was mostly rolled up, save a handful of greasy spoons selling similar evening comforts, a few konbini and a light, cooling rain.